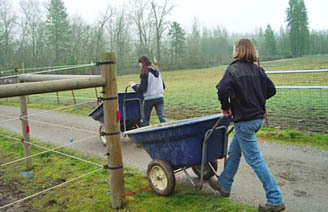 Mucking: There is about 2-1/2 to 3 hours worth of work to be done daily in order to keep the stalls and paddocks clean. We offer a generous trade rate for this work. Once you have enough hours to equal the cost of a lesson you can schedule one. 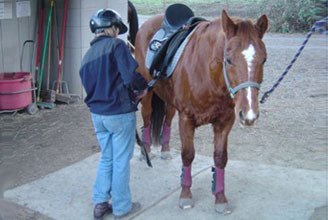 You can arrange your schedule so you are able to ride and have a lesson on regular basis. See Muckers in Action. This position is great for someone who either wants to enhance their skills with their horses, or someone who would like to learn enough to either own a horse one day and/or possibly become a trainer or instructor. This is a position that must be earned by first working as a "working student" for at least one year. 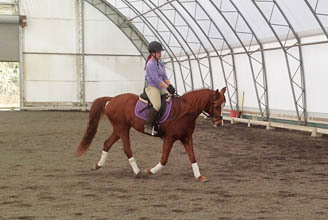 Riding and handling skills must excel to a level worthy of this title. The assistant trainer does not train the horses in place of the trainer, but assists with those horses and also schools the horses owned by the trainer.